Is sparkling water harmful to the teeth? Erosion is a growing problem in dental health and our lifestyle is much to blame. Fizzy and fruity drinks are the biggest culprit but also diets high of sugar and starches. Fashionable and seemingly healthy diets like juicing do play their part as well in dental erosion (I will tell you more about juicing later on this post). The reason I wanted to bring this subject up is that dental professionals do agree on the fact that fizzy drinks like coke and energy drinks, juices and alcohol are harmful to our teeth. But there seems to be a division amongst us when it comes to the sparkling water. I have read health news in my country’s largest newspaper where dental professionals state that carbon dioxide in sparkling water is not harmful to the teeth as long as it is plain sparkling water, no flavours or lemon added. In my opinion and in my experience it’s not so black and white situation. So is sparkling water harmful to our teeth? This is something I hope to find out by bringing this subject into discussion. To keep it short, the erosion is permanent loss of tooth structure caused by non-bacteria originated acids. These acids come e.g. from our diet, medications or medical conditions like gastric-reflux (heart burn) or bulimia. None of the above you should take lightly and all of them are costly to fix. 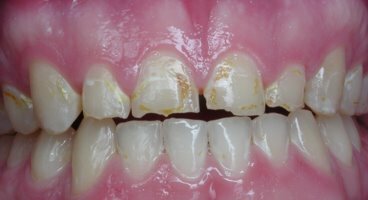 Why Do Some People Get Erosion on Teeth and Some Don’t? Remember that the plain water’s pH is somewhere around 7 and it is not harmful to the teeth at any way. Sparkling water has carbon dioxide which will become carbon acid when it comes in contact with our mouths. The pH of the sparkling water varies but normally it is between 4-6 (click here to one bottled water company’s info page). It is rare to find the information on the bottle about the pH of the water and often very cleverly they mention that the pH at the source is 7 which can be misleading. Us professionals are familiar with the fact that demineralisation happens when the pH in the mouth drops below 5,5. This is a fact. And when knowing this, it is difficult to accept that the sparkling water is not harmful. If the sparkling water has pH of 4,5 and the person keeps the bottle next to him at work and sips away every now and then (and perhaps even swishes it around in the mouth) then surely it is harmful to the teeth? Person is exercising at the gym and has sparkling water as a drink. She is dehydrated from the exercising and the saliva flow is poor due to this (= no saliva or very little saliva to neutralise the acids). She drinks sparkling water and swishes it around the mouth to ease the sense of dryness in the mouth. It must do a damage if this happens in weekly basis. Please note that this same scenario with any other fizzy or otherwise acidic drink is even worse situation. Still water (tap) would be the best option. For those who are not familiar with this diet, it is a diet where the juices are extracted from the fruits and vegetables. It is not blending where you put everything in the blender and blend it away to a smoothie. Juicing is drinking fruits and vegetables as a juice. From dental professional’s aspect this is very worrying diet. Let’s think about the worst kind of scenario where juicing can harm the teeth. Person wakes up and makes a juice from various fruits for breakfast. One of the fruits is lemon. Then she drinks it and swishes (I use this word a lot in this post so people would get the idea what is harmful) the juice around the mouth to get a fresh feeling after night. Then she goes and brushes her teeth – meticulously. What did she do that was harmful to her teeth? When we sleep the saliva flow decreases. When we wake up you have dry mouth and if you pour a very acidic drink (the pH of lemon juice is 2-2,6) in there, the damage is great. There is no saliva protecting and neutralising the acids. It takes a while before the saliva starts flowing again in the morning. This normally happens when we chew our breakfast and start hydrating ourselves with drinks. Drinking juice won’t activate your saliva flow and acids can cause damage to the teeth in peace when there is no saliva around. Brushing the teeth every morning after breakfast – especially after acidic juice breakfast – will wear off the enamel of the teeth for sure. You are brushing away the softened enamel. Every once in a while I see a patient whose teeth are hypersensitive. I go through the patient’s diet, oral hygiene habits and medical history. Often the reason for hypersensitivity is snacking and poor oral hygiene (lack of fluoride and build up of plaque) but sometimes there is no other reason than the patient drinking sparkling water between the meals. Devices like SodaStream at home make it possible to carbonate drinks like water at home. Some people use them many times a day. I once had a patient who had read the same article (mentioned in the beginning of the post) in the newspaper in which dental professionals were saying it is ok to drink sparkling water. This patient had done research on the subject and was already in defensive mode about it. So there was no way for me to convince him otherwise. But then again I am merely a channel of information and it is patient’s right to choose whether to take the information on board. It is easy to make people understand that flavoured sparkling water is very acidic due to the acidity of the flavouring. But many reject the suggestion that plain sparkling water could be damaging to the teeth as well. I don’t blame them as many of us dental professionals do the same. What I wonder is that how did these dental professionals come to this conclusion? My experience in the clinical field has proven that it is not all that simple when it comes to erosion. It is damaging to the patient’s dental health to suggest that it is.